Birmingham graffiti artist Andy Mills has created #DigbethDozen – a map of twelve independent bars and restaurants to visit in the area. So next time you are wondering where to go check out the artwork in Little Anne Street for inspiration, with venues ranging from a tapas bar to the region’s best street food event there should be something to whet your appetite. Congratulations to The Old Post Office in Warwick, which has just been awarded Heart of Warwickshire CAMRA Pub of the Year 2018. This independent micropub in West Street, was created by Tom Douglas, a publican with over 40 years experience in the industry and it is managed by his daughter Gem Douglas. The Old Post Office serves cask ale, craft beer and real cider. The Manor House of Whittington , has launched a new Spring menu. Nestled between Kidderminster and Stourbridge in the rolling Staffordshire countryside, this is a new all-day bar and restaurant offering steaks, wood-fired pizza, Sunday roasts and dessert platters. 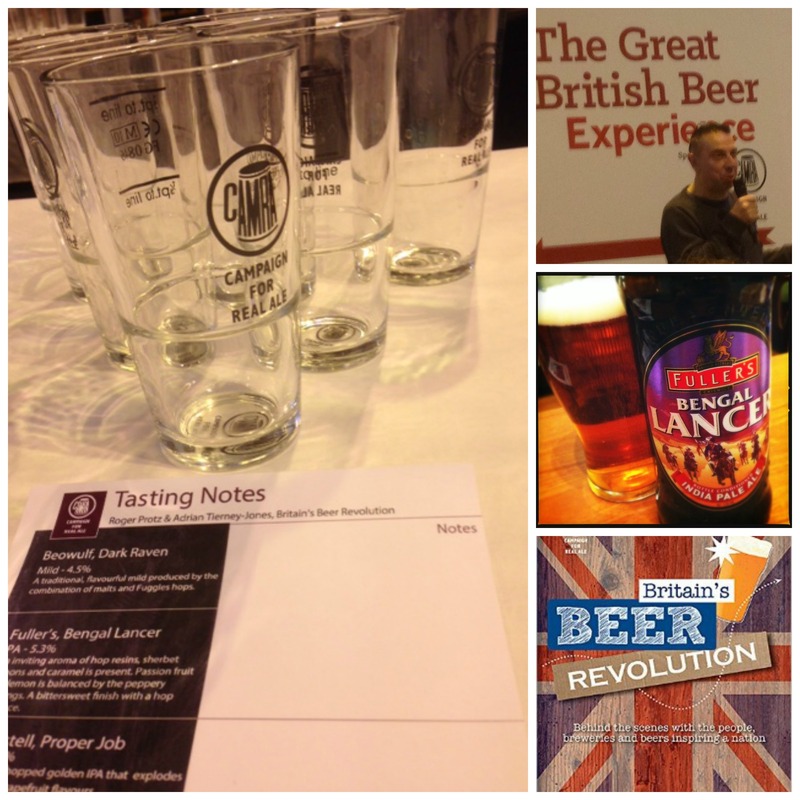 For this year’s show I wanted to try something different, so I took a seat at the CAMRA Great British Beer Experience and settled down to a lively 45 minute discussion and tutored beer tasting. The Great British Beer Experience does exactly what it says on the tin and showcases the diversity of UK ales. In the opening session beer experts and authors Roger Protz and Adrian Tierney Jones took us on a historical, geographical and sensory tour based on their book Britain’s Beer Revolution. We were given five different beers to try. Starting with a Beowulf, Dark Raven this traditional mild is a combination of malts and Fuggle hops. Next up was an English style IPA Fullers, Bengal Lancer with a refreshing citrus note. I was really enjoying Adrian and Roger’s anecdotes, even if I couldn’t find the “aroma of a Summer’s day” in the St Austell’s Proper Job! For the names alone it is worth exploring the different breweries and the aptly named Titanic Stout was a dark, strongly flavoured ale. We finished the tasting with an 8.5% Bodger’s Barley Wine, which was created in the 18th century to deter drinkers from French wines. Cheese and Beer with Christine Cryne on Friday – CAMRA’s National Director will infuse you with a selection of beer styles matching them to a range of cheeses. From a blue to a soft cheese, this tasting offers lots of flavour. Winter Warmers with Annabel Smith on Saturday – sample a selection of winter warmers ready for the festive season and gain tips on which beers to serve with your Christmas dinner. Meet a Local Brewery on Sunday – sample a selection of brews from Warwickshire’s Church End brewery. Brewery Manager Karl Graves will talk you through the art of brewing, giving visitors the chance to see inside a brewery grist and taste the raw ingredients. Slots are 11am, 1pm, 3pm and 4.45pm during the show, tickets cost £6-£7 and can be bought from either the BBC Good Food Show website or CAMRA stand D130. Although I am not yet a fully fledged convert to beer its bottoms up to the British heritage of pubs and real ale!